This Stage 2 air Intake system produces an astonishing 32 horsepower and 35lbs. x ft. torque and outflows the factory intake by 44%! This intake is the most sophisticated design on the market today. 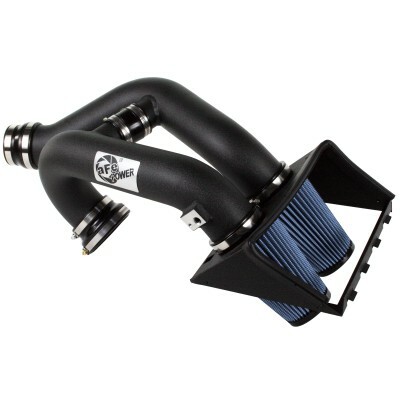 The equal length dual tube design with an H-pipe balance tube increases intake air flow and velocity increasing horsepower and improving throttle response and turbo spool times. Enclosed in a durable 16-gauge heat shield that uses the lower half of the factory air box, two 360 degree conical Pro 5R air filter for maximum flows. The one-piece heat shield requires no assembly and the filter is constructed with 100% polyurethane for long life and multiple cleaning cycles. Equal Length Intake Tube- This intake uses a dual intake tube design with an H-Pipe balance tube to balance intake tube pressures and maximize air flow and velocity.